The gardener’s best friend is his brown bin. And Peter Stanway’s has just got a whole lot friendlier, for he is one of the ten lucky winners of a free year’s worth of kerbside garden waste collections from Boston Borough Council. Peter, who lives in Swineshead, was one of those fortunate direct debit customers selected at random to receive their payment back. 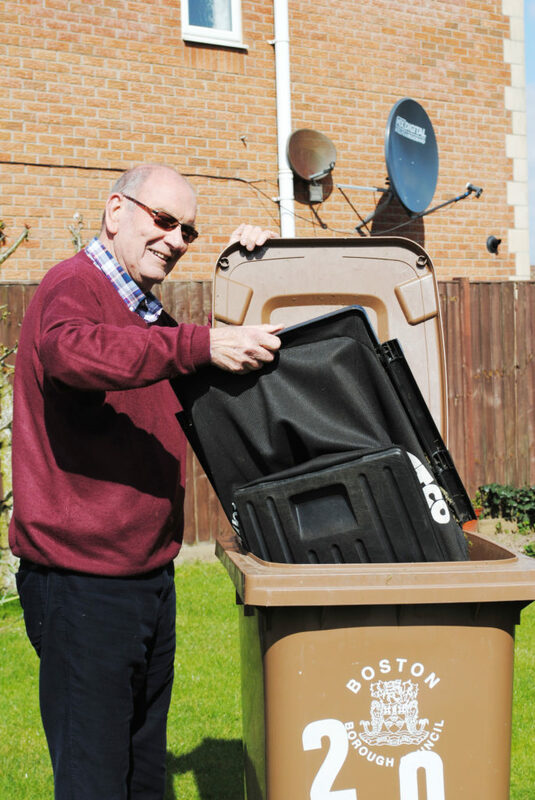 He has been a brown bin user since the service was introduced, saving him a mucky mess in his car and a drive to and from the tip. This year’s garden waste collections began at the start of this month. They continue until November and then resume in February until end of March with bins collected fortnightly, and there is still time to sign up. You can do this online at www.boston.gov.uk/gardenwaste If you have not used the service before you will have to pay for your brown bin (£25 delivered to your door) and then the annual service charge of £30 – no increase for the last two years. If you have a large garden you can have more than one bin. The additional charge for emptying more than one bin is £15 per additional bin. If you have a small garden you can always share a bin, and the cost with a neighbour. Garden waste MUST NOT be placed in the green bin and should be taken down to the new Household Waste Recycling Centre in Bittern Way, or home composted (compost bins can be purchased at a reduced price by going online at www.getcomposting.com or by calling 0844 5714444). Last year’s garden waste collections generated 5,000 tonnes of waste sent for recycling into compost. The other nine winners are: Leanne Fashanu, Derek Green, Melissa Reeve, P N Bradshaw, Linda Stones, Karen Neillis, Lyn Bell, Tina Doherty and Brian Young.